No the Jupiter was on Gratiot around 10 mile area. There was no round restaurant on south side of 8 Mile. I am familiar with that area since I worked at Ridge Drug Store from 1959 to 1960. Richard Siegel, Can you contact me? Max Kerner son Nathan was married to my GrandAunt Edna Meltzer. google my name you will find my email address. thanks. I'm looking for information about a restaurant that was in business in the late 1940's located on the corner of Gratiot and Eight Mile. It was called The Three Sisters. It was owned by Agnes, Lolly, and Cecil Salter. My father worked there after coming home from the war. The three owners were his aunts. I'd like to see pictures or any information someone might have. I am 80 years old and remember the park in my youth at 8 mile and Gratiot. Noisy but fun. The Motor City Speedway was at 8 mile and Schoenherr. I still have black and white 8 mm. movies at the track. Still have the same camera and projector, (Keystone). The Ridgemont golf course was located on 8 mile east of Gratiot by several blocks. All three sites were in Macomb County. The original Saratoga Hospital was at Saratoga and Gratiot. Behind it was a large brick houise of which was Dr. Tassi office whom was the hospital founder, of which later moved to State Fair and Gratiot. How do i know all of this: Dr. Tassi brought me into the world in November 1934 on Saratoga ave.
in an upstair two family flat. Amen. My fond memory from Eastwood Amusement was when I was about 15 and went there with my 17 year old boyfriend. There was a man there who had a large scale and if he guessed your weight incorrectly you won a skinny colorful wooden cane. I mostly remember my weight at the time and it was 111 pounds. I won a cane but I think he purposely guessed wrong since I didn't have a souvenir from my visit. Makes me smile to think of it. 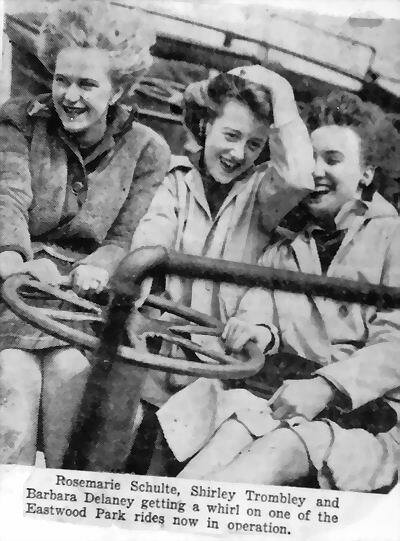 I also went with a girlfriend, who was a teenage model for Kerns, and they took photos of us and other teenagers on the roller coaster. That does not make me smile. im 84 yrs old, i remember eastwood park as a wonder place we and my friends would listen from the outside. the music from the greatest bands,and the italian pows who with a few guards enjoyed them selfs,it was truly a wonder place. My mom, Dorothy Kenton, married her first husband at the end of the Eastwood Park Marathon Dance in 1933. It was a 1200 hour marathon called Walk-A-Thon. They were married right there in the ballroom and everything was paid for by the sponsors of the marathon. I remember taking the Streetcar to the end of the line, I was about 9 or 10, at that time my Father was doing the sign work and painting the posters and banners for the park. I would go often and ride all the rides, I can remember one particular experience. They had a coin operated machine that had something to do with how much electricity you could stand (I think) anyway I put either a penny or nickel in the slot and OH Boy, I couldn't let go and what a shot of electricity I got. Never played with any more machines after that. What a wonderful era, you could go anywhere and be safe. I rode the streetcars and buses into my teens, back and forth to work at Harper Hospital where I worked part time and went to school (High School of Commerce) for $. 50 cents an hour. At that time the DMC was only a dream. I remember filling in for the Assistant Director's Secretary Nancy (Mr.
Rourke). Life was so simple and innocent. Eastwood Park life guard November 23, 2011 In 1949 I was a life guard at Eastwood park, for a eighteen year old it was the best of the best work you could do. The pool was run very good. The head guard was a classic good-looking, experienced, responsible man, he expected the best from his guards and got it. To get the job, and to see if you where qualified the head guard would go in the deep end of the pool and pretend he was drowning, the wan-be guard had to go in and save him, sounds easy enough but the head guards intention was to try and drown the guard trying to save him. In my case we had a stand off he couldn’t drown me and I wouldn’t give up trying to save him. I got the job. The pool was located next to the big band music hall. Going by memory the pool was at least Olympic pool length and wide enough that it required two guard chair stands across from each other about one quarter the distance from the deep end, on weekends and hot days both chairs held guards. On busy days I would save on average about 3 swimmers a day. Being a pool guard is different then a beach guard, generally you get in behind the person in trouble and raise them and push them to the side of the pool with another guard waiting to pull them up out of the pool. A couple of events come to mind, one was a young girl with her boy friend about 12 to14 years old jumped into the pool at the deep end, the poor girls bathing suit top came off, instead of swimming to the side of the pool her modesty took over she covered her self with her arms, then preferred to drown as opposed to swim and save her self. We got her to the side of pool, the guards got around her so people wouldn’t see her, one of us dove down in the pool and found her bathing suit top to save the day. The other event I remember happened on a busy day , there was a high diving board with a ladder to get to the top of the board , swimmers where lined up to go off on the high board, about three people on the ladder and the rest in line on the deck. A young man that did not look to confident caught my attention, he stayed in line, then when he was on the ladder ready to go on the board I could see he was looking back down the ladder, I’m sure if the latter wasn’t full he would have gone back down, in any case when he was on the board he goes back and forth a couple times, then decides to jump off the board but as he jumps he decides it was the wrong thing for him, but it was to late he twists in the air trying to grab the board scrapes the front of himself on the board, when in the water he couldn’t swim, I pulled him out of the pool finding he couldn’t speak English and I couldn’t speak his language, in any case I had him go down to the shallow end of the pool where after a short time he starts to drown again that’s when we had to have him leave the pool. On Hot days we would put blocks of ice in the pool to cool the water. The pool layout behind the deep end deck had a fenced in area with sand for people to sun them self, we called it the beach. The problem with beach area was when people came off the sand they where supposed shower off the sand before going into the pool, over time the pool would accumulate sand on the bottom of the pool, from time to time it was the guards duty before opening, to power hose the sand down to the deep end drain where it would be swept away, we would have to wear lead shoes and air mask with a long line connected to a plane air compressor. I didn’t smoke which made great sport for the other guards to send cigarette smoke in the pump air intake when it was my turn for washing down the sand. Eastwood Park Pool was a fun place. George Artis. I lived in my grandparents home on Lydia street acroos Gratiot from the park. I can still remember seeing the parks lights and hearing all the noise from the park. I can remember playing on the ruins of the park after it was torn down. I'm now back in my grandparents home and memories keep flooding back of catching the electric street cars at the turn around where the park used to be. Also remember hearing the sounds from the race track on 8mile and Schoener, every weekend the motorcycles, sprint cars and stockers could be heard. Lots of memories when I sit in the yard at night. John, That was Saratoga General Hospital. This message is for you Mr. JOHN G. KILEY. As a native Detroiter I read your message and couldn't help but to reach out to you in respect too you not believing in the after life. I too also lost a loved one, my son to be exact. Unlike you though I have never dreamed about him because I'm at piece with where he is. He is with our Heavenly Father in a life very much more beautiful then you and I know. In order for you to find that piece you need to accept Jesus into your heart. Ask him to come into your heart and change what ever there is that is troubling you. I did this over 35 years ago and today I look forward to the day when I will cross over to the other side and Jesus will say to me Dad be hold your son, and son behold you Dad. What a grand and wonderful time that will be. You too can find that piece just accept Jesus into your heart and life today and a whole new joy will be yours. The name of that Hospital is Saratoga Hospital on Gratiot between 7 and 8 mile rd. MY BROTHER JOSEPH AGE 15 WAS KILLED AT EASTWOOD PARK IN APRIL 1949. I AND HIS 2 FRIENDS WERE WITH HIM ON OPENING DAY THAT YEAR. HIS FRIEND ACCIDENTALLY SHOT HIM IN THE STOMACH AT THE AT THE SHOOTING RANGE. HE WAS HIT WITH A 22 CAL. BULLET AND DIED 7 DAYS LATER AT HE HOSPITAL AT 7 MILE AND GRATIOT. I DON'T REMEMBER THE NAME OF THE HOSPITAL. I WAS 13 AT THE TIME AND I STILL MISS MY BROTHER AND STILL DREAM ABOUT HIM AND THINK HE IS STILL ALIVE. IT HAS BEEN OVER 60 YEARS AND IT IS SOMETHING I WILL NEVER FORGET. NOT ONLY WAS HE MY BROTHER, HE WAS MY BEST FRIEND. I DON'T BELIEVE IN THE AFTERLIFE BUT IF THERE IS ONE, I WILL BE LOOKING FOR HIM. I THOUGHT I WOULD SHARE THIS WITH YOU JOHN G. KILEY. 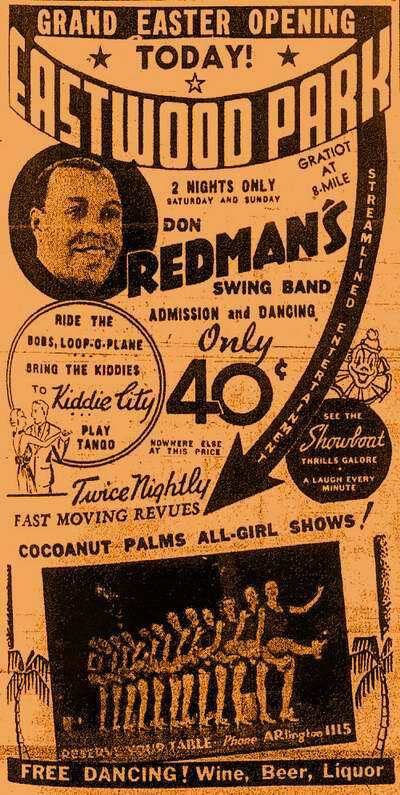 My grandfather''s band played at Eastwood in the World''s Fair Ballroom on Saturday July 11, 1948. I have a hand-written reciept by Henry Wagner given to my grandfather for his services. My grandfather''s band was ''Jimmy Strauss and his Orchestra''. He played in the 40''s all around town. I''m just now trying to research everything I can about it!! After his days playing Big Band music, he settled in Elkhart, Indiana where he opened at very successful bakery business. An answer to Joe Mayes: Though it was before my time, I lived in the Gratiot & 7 Mile area. The auto racetrack was down the street at 8 Mile and Schoenherr on the Northeast corner. It was not part of Eastwood Park. Look up Motor City Speedway above. Was there to your knowledge ever auto racing at East Wood Park, east Detroit. I am 67 and lived on taoma street not far from the park. I do not recall auto racing, an old timer like my self says there was, what do you think or know. My dad liked to gamgle and would go there to play horse shoes ect. I would tag along. Good times. Everything was such a mystery when you are a kid. We lived in the in the new track homes, moved away in 1952 to fraser Mi. Thanks Joe Mayes. Dear Mr Siegel, By way of introduction, my name is Glenn Mittler. I''m 60 years old and reside in Elyria, Ohio; about 25 miles west of Cleveland. My recent retirement after 35+years in the Elyria City School system has permitted me to re-visit other long-held interests; chief among them, the music and career of the late bandleader, Glenn Miller. My research indicates that Glenn Miller and his orchestra appeared at Eastwood Gardens on the following dates: July 15th-19th,1941 July 17th-23rd,1942 I read with extreme interest that your grandparents, Max and Flora Kerner operated the park. In fact, Glenn and your grandfather Max played golf together. I am respectfully wondering if you could contact me via my e-mail address as I''d like to learn more about your grandfather''s association with Glenn Miller. My interest and research extends way beyond merely collecting his records. Mr. Siegel, thank you for your time interest and consideration. May I hear from you? My e-mail: glenn_mittler@yahoo. com Respectfully, Glenn Mittler. This is in response to Richard Siegel''s entry. I have been trying for a long time to locate the family or descendents of Henry Wagner and Max Kerner. I have many fond memories of summers spent at Eastwood Park. My father designed and built the swimming pool at Eastwood Park. He built many such large pools up and down the east coast during that period. My mom and dad met and were married in NYC. Around 1941 we came to Detroit to visit my mom''s mother who had moved here from the family home in Pennsylvania, and we ended up staying. By that time my Dad had given up his design and construction business. Henry Wagner asked him if he wanted to run the swimming pool during the summers and of course he agreed. My dad, mom, and brothers were all competitive swimmers and my dad held the world long distance record. His name was Capt. J. N.
Seymour, Jr. Everyone called him Cap. He put on big aquatic shows each year, with fireworks, high divers, the works. Henry Wagner and Max Kerner treated us like family. In 1949 my dad hired me to work the bathhouse counter during the summer. We would come every day to the pool from our home near Wayne University, taking the streetcar. My dad knew everyone that worked in the park and when I was younger, I met everyone there. The Ballroom attracted the BIg Bands of the 40''s. The Fun House was the best! This was my childhood playground. Mr. Siegel, was there also a Nate Kerner? I recall that name and also Maxie Rosenbloom. We spent time at Edgewater Park also, and Jefferson Beach. Although the official reason for closing the park was alleged illegal gamblilng, the real reason was something quite different. I would love to know more about what your family did after the park closed. Those were fabulous years and I have very fond memories of the owners. My grandfather Max Kerner and my grandmother Flora Kerner owned the park with my uncle Henry Wagner and his wife my grandmothers sister Ann Wagner it had the largest open air dance hall in the world during the 1940ites era. Glen Miller willed his golf clubs to my grandfather. My father Bernard Siegel met Maryln monroe there when she was a starlet. my family owned all five of the amusement parks in the detroit area at that time. my grandfather was kidnapped for ransome. My son Austin got it wrong my other grandfather was Max Siegel he owned Siegels department stores. The park was closed down because of gambling then today gambling is legal. and also in time there were houses built near bye where the people complained about the noice level. I am searching for Pictures of the old Eastwood Park on eight mile in Detroit. My Mom and Dad danced their in the 40''s and I would like to show them pictures of great memories of their past. Thank you. Mary Lewis. When my uncle, Ben York was in his early 20''s he was the pool attendant at Eastwood park (1930''s). My Aunt Marie (nee LaFaive his wife) used to spend a lot of time at the park, probably to keep an eye on her handsome husband. One day while sitting at the pool she struck up a conversation with a woman. Turns out her husband was performing at the park. The woman''s husband was Danny Thomas. Mrs. Thomas spent a number of afternoons with my aunt while Danny was performing at the park and they became friends. Eventually my uncle and aunt moved to Florida, 1940''s. My uncle was involved with the Olympic swim team and died in the 1980''s, but whenever Danny Thomas was performing in Florida he always sent tickets to my aunt to attend the show. Thank you for this opportunity to add this to your collection. My name is Robert A. Louwers. I am 82 years old, soon to be 83. I grew up in Detroit, Michigan. Here is my story about Eastwood Park. My brother needed lumber to build a porch. I went with him to Eastwood Park to buy lumber because they were tearing down the park in the spring of 1952. They were going to charge us $100 dollars for the lumber that we needed. This was too much money for us to spend. They said we could take the whole bingo hall for $300 dollars, but we had to clean it down to the ground. We said we would take it. Now we had enoughwood to build my brother Donald''s porch. (age 25). The contractor now came to us to see if we wanted to buy the dance hall. I counted over 250 2x8''s underneath the building. It was five stories high. We used most of this wood to build a duplex for my brother in law, Marion and my family. This cost $350 dollars. Marion and I were 27 years old at the time. The tear down took over 6 months, cleaning and sorting of the used lumber took another 6 months. After using this wood, 14,000 bricks, and much hard work and labor, the duplex was finished in 2. 5 years, and we moved into the house in 1955. To this day, it still stands strong, with white pine 2''''x12'''' lumber floor joists. Having a ball at the different sites, I grew up at 9mi. & Schoenherr Rds. Used tto take 9mi. Greyhound bus to Gratiot and walk to the park. Mind you I was all of 12 yrs. old. Those were the days. Safe to !! Enjoyed the pool, but most of all the fun house. The walk in over the air blower in the floor for you know what. Then the barrel to walk thru. 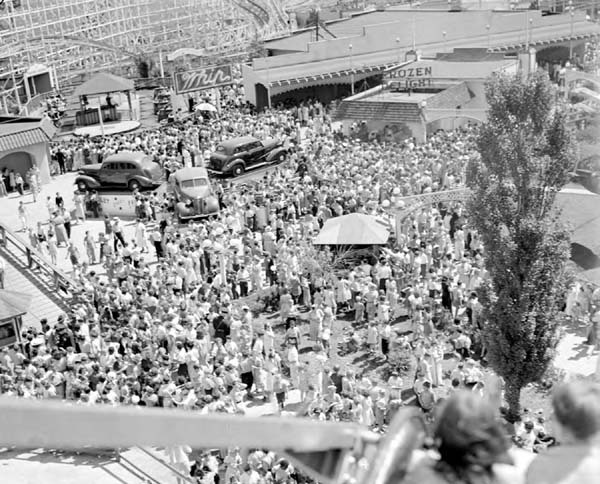 Next the semi flat wood ride that you started in the center and wasnt long everyone was off the ride. The slide was really fast, get on burlap bag and slide. Burnt arms couple of times on the sides. Stan Yee who I knew worked at one of the game booths in his younger years. He and his buddies whould stop at my parents dairy bar after work bring home cupie dolls and other items. Remember White Castle as well at Top Hat across Gratiot on Detroit side. Only sad memory that on one of my trips to swim left bike unlocked and someone stole it. I had bought bike with paper route earnings''. Thanks again for these wonderful sites. 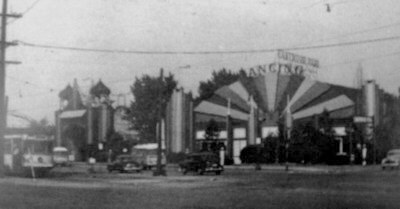 They also had a very large tent that housed so-called freak-shows. The White Castle is indeed still there. In fact, they recently had a news story on Fox 2 about its Valentine''s Day promotion. I remember Eastwood park well. We lived near by on Edmore. I had a paper route on Carlisle, The first street south of Eight Mile, from 46 to 49. I had a membership to the swimming pool. 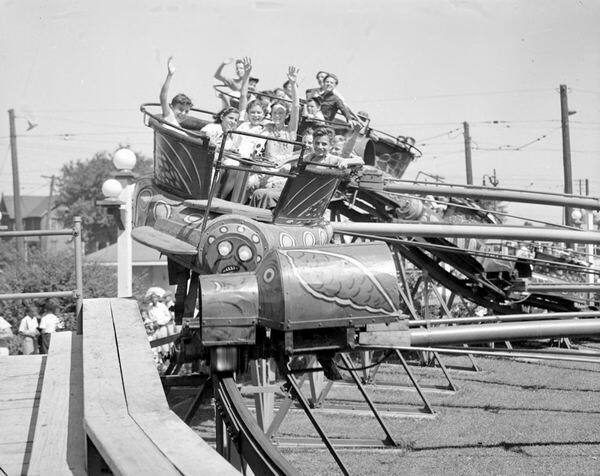 An uncle took me there for my 6th birthday and we rode the coaster. I''ve been hooked ever since. That was a White Castle across Gratiot. I think it is still there. When White Castle had the 5 for 25 cents coupon in the paper, I would start out my paper route by going to the White Castle first and get five sliders. My great grandpa Max Siegel owned the place for a while. My parents tell me it had the biggest dance hall in the US. I think it was shutdown for the gambling troubles it had. I wish I had more photos of it. The site of Eastwood Park,was a 75 acre farm,owned by the Duflo family,in fact ,8 mile rd. was originally named Duflo rd. it ,this was in 1845,it wasl then passed on to the Sprenger family,this is how Sprenger st in Eastpointe got it''s name,it was part of the original farm,also,Ego st was named after Celestine,Ego,who was the mother of Elizabeth Sprenger,the Sprenger family consisted of 5 brothers & sisters ,the Sprengers moved to a 120 acre farm on VanDyke&11/1/2 mile rd in Centerline Mi. wher the Sprenger family farmed for many years. the sprenger family leased the Eastwood property to the owners of the park,until it was condemned & later sold,i Don,t think any one could have lived on the property where the park stood,it was always an amusement park,my wife Elizabeth is the great niece of Elizabeth Sprenger,we were married in 1945 at St Veronicas church in what was then East Detroit,my wifes maiden name was Elizabeth (Bette Laethem). Any one wishing further info. on Eastwood parl,can email me at jdh1927@verizon. net Joseph Hartley. 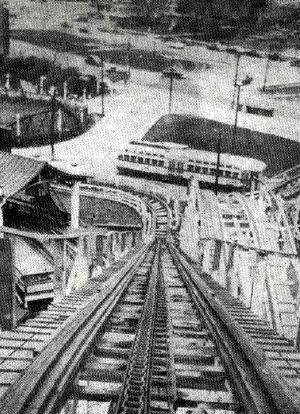 My Great Grandfather, John Robertshaw, built the Roller Coaster from Eastwood Park. It was originally built in Electric Park in Detroit but, when closed, was taken apart and relocated to Eastwood Park. I remember eastwood park well in the early 50s I spent a lot of time there roller skating and working there so I could skate free we had a lot of friends there. are any of you out there? love your site. When I was growing up in Port Huron during the late 30s and early 40s, my buddies, brothers and I use to hitch hike to Eastwood Park to ride the roller coaster. I also got my first tattoo at Eastwood Park. Also hitch hiked to see the Detroit Riots. 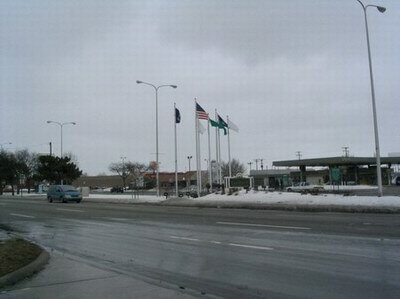 Still drive thru this area when I vacation in Port Huron. We always stopped at White Tower for hamburgers. It was on the opposite side of Gratiot. Do any of you Senior Citizens remember White Tower? P. S. I also won a live rabbit at Eastwood Park, took him home and he lived for sometime. To make it even more frighteningly attractive, the roller coaster at Eastwood was said to have been condemned by city and other officials. Of course, it wasnt but that belief made it more thrilling to ride it. Ed. C. Weyn: The date of the riots you refer to is 1943, not 1945. Cyrll Wagner did not have anything to do with Electric Park so he did not start his career there. Henry Wagner started his career at Electric Park. Cyrills Father, Henry Wagner set up his sons with Edgewater park while Henry ran Eastwood Park. Jefferson beach was brought during this time also Walled Lake was bought later. Cy was my great friend & business partner in some things & we went everywhere together. 1943 went on double date with Don,Micky & Blance Matthews. I was with Blance but a few days later I dated Micky, and married her May 15,1944 when I was Air Corps. Cadet. I lived at 9&1/2 and Gratiot and would walk to the park every week and go swimming or ride the big slide on potato sacks. We would board the streetcar there to go shopping or to go downtown. The park was a part of our growing up in East Detroit. 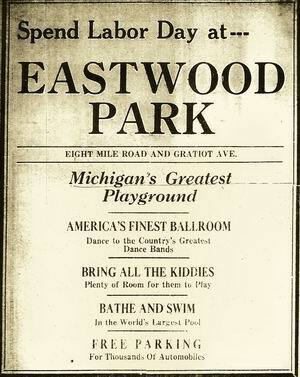 As a little guy, maybe five years old in 1952, my Aunt Eleanor took me to Eastwood Park. She was buying me a cotton candy, when a guy walked by with his bear. I remember that the bear had a pink striped collar on. We then went to the merry-go-round. I have no idea why that sticks in my mind. We would walk up to the park from Pfent St. and stop at White Castle (right across the street) and get 12 sliders for a dollar,I can only remember the sword swallower, Roller Coaster and the riots around 1945. We had moved on Bringard and Kelly for some part of my child hood and I remembered something about Eastwood Park. It wasnt as fancy as the Jefferson Beach Park but it was nice. What i remember my mom telling me is that they had a rubber jungle and it caught fire. Thats what I was told. A lot of the crowd that hung there started hanging out at Jefferson Beach. Thats when it started becoming over crowded and too wild for us. I lived on the site of the former Eastwood Park, and my mother often went there growing up. 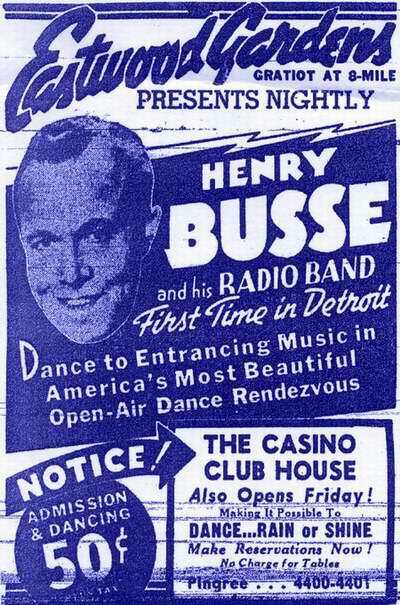 My mother said that it closed because of the East Detroit officials problem with gambling or games of chance. Again, she is not sure after all these years, but maybe somebody knows more about it? She said it was a great park, and she missed it. Cyril Wagner, who started his career at Electric Park in Detroit, started Eastwood park when Electric Park closed. The park was located at the end of the streetcar line, which was a common method to increase ridership on weekends. Eastwood park was located in Eastpointe Michigan , (note the DSR had a turnaround at the park) the DSR turnaround was removed when Gratiot Streetcar Service ended in 1956.